Nobody may be the first to tell you that the biggest fish ever caught in mainland Mexico at PlayaLaSaladita is right here in front of Rusty's Surf Villa. Get the BBQ ready when you see this umbrella set up for the catch of the day, anyday of the week. In between sets when the surf is down this is another way of relaxing before some beautiful sunsets. Life is truly "As the Tortilla Turns"
Waking Up at Rusty's Surf Villa to the sound of chickens and rousters is everyday living on the beach here at Playa LaSaladita Mexico. Perfect Surfing or Fishing, Snorkling, Long walks on presteen tropical beach. More the reason to visit Rusty's Surf Villa in mainland Mexico. Manny's Surf Trip is also a Birthday Party for Rachel and to have it with surfing amigos couldn't be better. Everyone enjoyed the evening at Rustys Surf Villa. Pool Parties are always happening here as the Pool is in the center of the house with the clasical swim up pool bar that is always wet and wild. Getting primed for the events of the evening with a Birthday Party in the Mix makes the nights celebration a perfect way to enjoy Rustys Surf Villa, Playa LaSaladita, Mexico. Manny taking a wide angle digital of Rusty in the Pool Party the eve before they flew back to Encinitas California. Just having fun trying to decide who is the best at keeping above water. Party time at Rustys Surf Villa after some Big Boy Tequila the Water Contest are on. Surfing locals visit Manny's Party into the evening was a perfect way to spend the evening. Manny is testing his shapes daily here at Playa LaSaladita while visiting Rusty's Surf Villa, making changes to his surfboards once back in the shaping room fine tuning is the art that surfers are waiting for. Pure Stoke once you ride lefts that have 300 yard run outs or more you can truly say "Its the Only Way to Travel" Long paddle outs but its all worth while as you enjoy Playa LaSalaidta perfect wave you keep comming back every chance you get. Manny ripping up the glass one Wendsday morning just because he can. 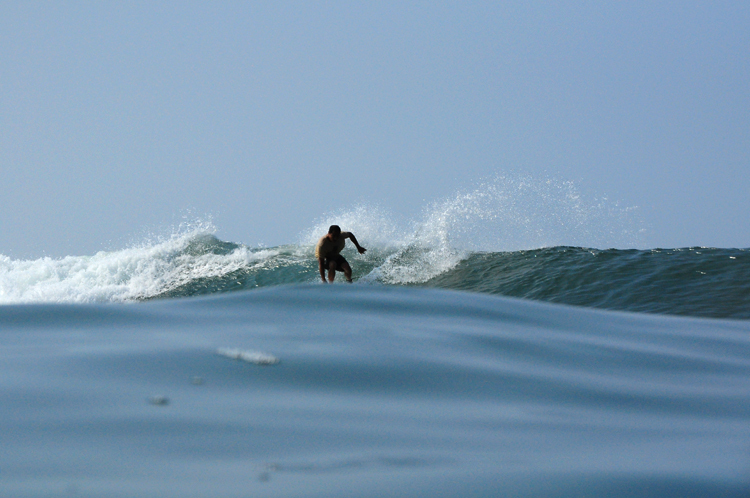 Playa LaSaladita has one of the longest surfing waves in mainland Mexico. Ultra high tides in October but swells back to back to keep you surfing everyday of your vacation will be the report once back in his shaping room in Encinitas Californa.